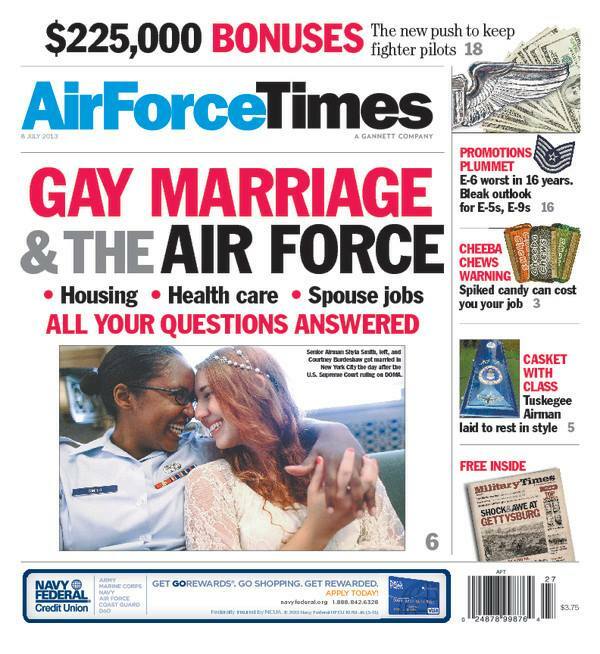 Now that the Supreme Court has ruled the Defense of Marriage Act has been ruled is unconstitutional, Air Force Times is looking at how things will change for airmen. In this week’s edition, we tell you how the Supreme Court’s ruling will affect housing, health care and other issues for gay and lesbian airmen. Also this week, the selection rate for technical sergeants has plummeted to its lowest point in years. Air Force Times examines what has caused this promotion logjam and what it means for staff sergeants and senior airmen. In the category of “news you can use,” the Air Force has declared “Cheeba Chews” off limits. The edible marijuana is packaged like candy, but one bite could cost you your job. Also, budget cuts have led the Air Force to ground squadrons, but one type of aircraft is still flying a lot. You can read why the Air Force feels it needs to keep this aircraft in the air. And a Tuskegee Airman has been laid to rest in a custom casket designed by his sons. The two men, who own auto-body shops, felt that customizing their father’s casket was the best way they could honor him.